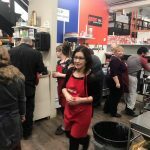 Syncrude Corporate Challenge on November 29, 2018 from 7am to 7pm! 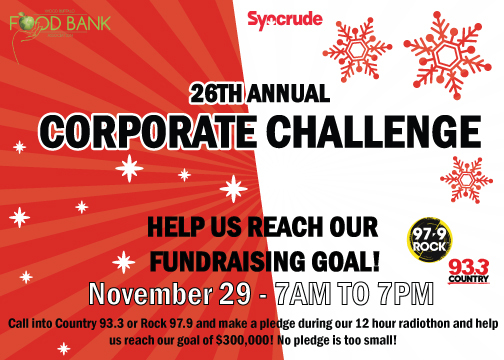 We are encouraging everyone to call in and make a pledge, helping us to reach our goal of $300,000 to kick off our 3-day Syncrude Food Drive! 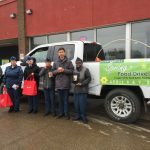 In 2017, our hampers fed 17, 687 individuals in our community who rely on the Wood Buffalo Food Bank Association. This year we have continued to see a steady high level of need, and with 2018 coming to a close, we are confident that our statistics will once again show that there is still a large need for our services. Keeping these statistics in mind, it is imperative to keep the food bank open, and ready to serve members of the Wood Buffalo region. 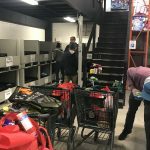 Our Food Drive kicks off with a Corporate Challenge on November 29, 2018. This Corporate Challenge lasts one day, in partnership with Country 93.3 and Rock 97.9. Syncrude starts off the challenge by announcing its corporate donation live on air. From there, they challenge other organizations to donate. Both radio stations will be taking pledges from 7:00 am – 7:00 pm. Everyone is welcome to call in and pledge: Corporations, companies, service groups, clubs, and individual donors. If you would like more information about how to pledge, please email Anna Noble, Communications & Development Manager, by clicking the button below!